It was Brooklyn against Albany in the eight-round main event featuring undefeated lightweight prospects Wesley “El Bongocero” Ferrer, 135.8 lbs., and “Ill” Will Madera, 135.4 lbs. This was a classic boxer versus puncher matchup, with Ferrer jabbing to the body and head and Madera working to close the gap. When inside, Madera focused on attacking the midsection. In rounds three and four, Ferrer’s switch to the southpaw stance proved very effective as Madera could not figure out how to get past the jab. Back to orthodox in the fifth, Ferrer added left hooks to his arsenal as well. Madera came on strong in the last three rounds, again landing in combination to the body. In an exciting seventh stanza, Ferrer and Madera went toe-to-toe, trading powerful shots. The final three minutes saw Madera continue to throw in combination to the body and Ferrer setting up straight rights with flashy jabs. After eight rounds, the scorecards read 77-75 each way, and 76-76, for a draw verdict. Both boxers remained unbeaten, with Ferrer 12-0-1 (7 KOs) and Madera 11-0-1 (5 KOs). This bout was promoted by DiBella Entertainment in association with Liveco Boxing. In addition to his boxing career, Madera, a father of six, works as a residential counselor at the Center for Disability Services in Albany. Now managed by Tommy Gallagher, Ferrer was a two-time New York Golden Gloves champion, 2012 New York Amateur Boxing champion and New York City Metro Tournament champion, as well as a participant at the 2013 National Golden Gloves. In a battle of undefeated welterweight prospects, Irishman “Lethal” Larry Fryers, 146, dominated Puerto Rican Charles “Mr. Hollywood” Natal, 144.2 lbs., for six rounds with a vocal fan base cheering from ringside. Fryers was the busier and more aggressive fighter throughout, consistently landing a stiff jab and straight right hand upstairs. The slick Natal, originally from Catano, Puerto Rico, but now fighting out of Cleveland, OH, was a bit tentative, content to play the role of counterpuncher. While the Puerto Rican did pick up the pace in the second half, showing his best work in the fifth with combinations on the inside, overall Fryers outworked him. The Irishman closed the show, digging damaging hooks to the body in the final frame. The judges tallied 60-54 twice, and 59-55, all for Fryers via unanimous decision to improve his record to 6-0 (2 KOs). Suffering his first defeat, Natal’s ledger dropped to 9-1-2 (3 KOs). Fighting out of Clones, County Monaghan, Ireland, now based in The Bronx, NY, Fryers began boxing at 10 years old at his father’s gym, and turned pro in August 2016. This bout was also promoted by DiBella Entertainment in association with Liveco Boxing. Former WBC world lightweight champion Dejan “Dynamite” Zlaticanin, 139.4 lbs., needed less than two minutes to rebound from his first pro defeat, stopping Colombian Heivinson Herrera, 137, in impressive fashion. The southpaw bobbed and weaved his way inside, saw an opening to land his overhand left and kept throwing it. Trapping Herrera in a neutral corner, Zlaticanin unleashed a combination to send his foe to the canvas. With Herrera in obvious pain, the referee halted the action at the 1:57 mark. Zlaticanin, who was the first boxer from Montenegro to win a world title in the sweet science, improved to 23-1 (16 KOs), while Herrera fell to 22-14-1 (16 KOs). Zlaticanin won the WBC 135lb. world title in June of 2016, but then lost it to Mikey Garcia on January 28, 2017. With his first return victory, Zlaticanin, trained by James “Buddy” McGirt, is ready to climb back up the world rankings to seize another title opportunity. Undefeated junior middleweight prospects Hurshidbek Normatov, 153.4 lbs., and Nicklaus Flaz, 151.6 lbs., clashed in an action-packed six-round bout with an ebb and flow throughout. Distance was key for both fighters, with the Puerto Rican Flaz, of Vega Alta, controlling the inside and the southpaw Normatov, of Andijan, Uzbekistan, the outside. Flaz applied pressure early on, while finding a home for his overhand right. 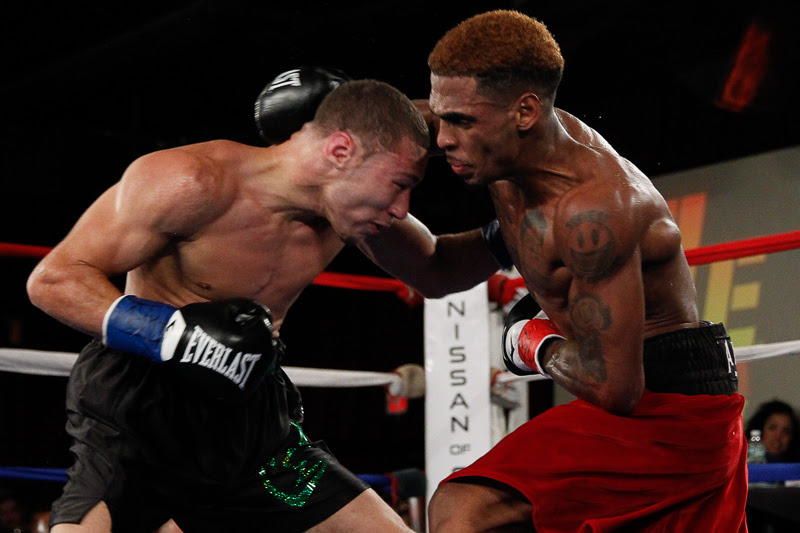 Trained by Andre Rozier out of Brooklyn, NY, and managed by David McWater’s Split-T Management, Normatov had his best moments keeping Flaz at bay with his jab and landing counter right hooks. Many rounds included exciting exchanges. Some of Flaz’ body attack landed below the belt, resulting in two point deductions in rounds four and five. As the Puerto Rican fatigued late, Normatov continued to land his counters. Following six frames, while Flaz was busier, Normatov was the more accurate puncher. The scorecards read 59-53, 58-54, and 57-55, all for Normatov by way of unanimous decision. Normatov climbed to 5-0 (2 KOs), while Flaz ended the night at 5-1 (4 KOs). Both Normatov and Flaz were highly touted amateurs, with Normatov competing in 324 bouts, winning the 2014 European National Championships, and Flaz compiling an 88-7 record, becoming a three-time National champion. Dominican heavyweight prospect George Arias, 240.8 lbs., of The Bronx, NY, earned his fifth victory of 2017 by scoring a second-round knockout against Taylor, Michigan’s Juan Goode, 260, to improve to 10-0 (6 KOs). In round one, Arias showed fluidity, boxing on his toes and jabbing to keep Goode at bay. A few overhand rights hurt Goode near the bell. Arias was busier in the second, landing in combination. A series of left hooks sent Goode to his knees for a full count at the 2:19 mark. Arias, who won the 2014 New York Golden Gloves tournament as an amateur, is now trained and managed by Leon Washington Jr. and advised by Andre Rozier. With the loss, Goode’s record evened up at 8-8 (6 KOs).